A LEADER IN COMMERCIAL LITIGATION, GAMING AND MORE. Mr. Bice’s advocacy is well known both in and outside of the courtroom, in state and federal court, and at the trial and appellate levels. A highly skilled litigator who is more than familiar with large and complex cases, Mr. Bice’s understanding of and experience with every stage of a case as it moves through the judicial system serves his clients well. His experience allows him to represent clients from start to finish, providing keen insight and astute precision of both the law and procedure. Mr. Bice has tried many cases to judgment in both state and federal court, and has successfully argued numerous appeals before both the Nevada Supreme Court and the United States Court of Appeals for the Ninth Circuit. Mr. Bice represents several of Nevada’s largest gaming companies in corporate governance contests, commercial litigation, and gaming disputes. He also represents the gaming industry’s political and lobbying arm, the Nevada Resort Association, on legislative, election, and constitutional matters, and serves as outside general counsel to the Las Vegas Visitors Authority on similar issues. In addition, Mr. Bice represents governmental and quasi-governmental entities in civil rights actions and election matters, as well as on constitutional questions. 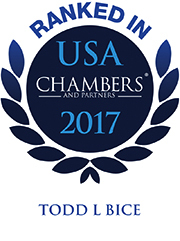 Mr. Bice was recognized as a “Top Ten Lawyer: Gaming” in the Las Vegas Business Press, adding to his Preeminent Martindale Hubbell rating, and his multiple “Best Lawyers in America” recognitions in the areas of commercial litigation, first amendment law, land use and zoning, and mergers and acquisitions.